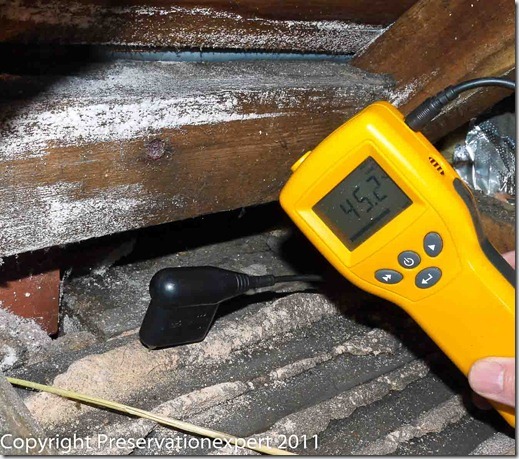 You are here: Home / Damp / Damp stains on a chimney breast and adjacent ceiling – It may be salts. Damp stains on a chimney breast and adjacent ceiling – It may be salts. I’m finding that the number of enquiries relating to damp stains on chimneys is on the up. The common complaint is that the roofer has either fixed the stack or the flashing, but the damp still comes in. Usually the roofer has been back a couple of times or three and still the problems persist. 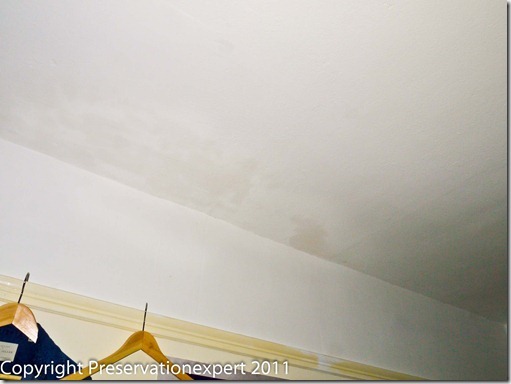 Above – Stains on the rear bedroom chimney breast and ceiling. This is a short example of the problem I investigated this week in Harrogate, West Yorkshire. Salt contamination from concentrated flue gas salts which persist has caused this issue. Typical symptoms are damp patches, which may or may not be salty looking. They often come and go with damp weather, though it doesn’t necessarily have to rain. A muggy day will be sufficient for the stains to become more clearly defined. Often the damp stain will feel greasy to the touch (like your skin does when you’ve been swimming in the sea). Of course, the first thing to do is check for leaks and fix them. Leaky flashings, pointing and open chimney pots are the most common causes. But when these are clearly in good condition, or have been repaired, hygroscopic salts are the most common cause. On the featured survey I was able to get in the loft and check for leaks myself. In the following image there are signs of water ingress. With salts on the timber. However, the trimming joist is securely fixed in intimate contact with the chimney stack, shouldn’t it be wet? Contrast this with the reading seen below, taken from the back of the ceiling plaster. This reading is 45% WME – substantially higher yet visibly free of salts. This is because the salts are hygroscopic and are causing the meter to over-read; because they are absorbing water vapour. You may wonder where we get these two different salts? Well, the salts accumulated on the roof timbers are there due to years of tiny water ingress and condensation on the underside of the roof slates. This runs down and wets the timber, leaving minerals they dissolved along the way. Repeated wetting and evaporation has concentrated those seen here. These are from the slates, back-pointing, external chimney pointing and such – they are relatively free of flue gas derived ammonium nitrates and chlorides. Further down the stack, the chimney is encased in a porous plaster and this, combined with high humidity in the room below means that once wet, drying is slow, there’s plenty of time for salts to migrate through to the plaster and stay there. In the above image, note that the plaster lath ceiling goes right up against the chimney brickwork. Our houses are quite humid these days, what with double glazing and all manner of steam producing gadgets in the kitchen. Not to mention showers, baths and drying clothes. Combine this with a cold old chimney stack and any salt contamination can develop into a serious and disfiguring problem. High humidity, resulting is vapour from the house penetrating the chimney, where the cooler temperature raises the Relative Humidity to near dew point. Some of the salts derived from flue gasses can become deliquescent at 85%RH or so (I have Graham Coleman to thank for this science bit), so in effect they become liquid and are drawn through to the plaster via capillarity – salts move in solution; no other way. The end result is that the plaster is now hygroscopic and will always be so. The only solution is re-plastering. Disposing of the contaminated material to waste. Don’t use a lightweight gypsum based plaster to repair the damage. Either use a cement based water resistant system or, dry line the wall on an independent lathing system or over a vertical DPM. If you must use a lime based plaster then either accept that salt may work through again later or, render onto laths, leaving a small gap behind, so the lime is isolated. Care is needed with the ceiling if that is effected. When ready to replace the ceiling use some vertical membrane or butyl tape to separate the plasterboard from the chimney. The chimney is saturated with salts and any gypsum products which touch the area affected will draw more salts. If you are using a hard wet plaster method, a layer of latex sealer or a cementitious ‘tanking’ slurry will help too. Why not ad some SBR to the cement mix to reduce permeability? I like Safeguards Bond-aid plus or SikaBond SBR. I hope the above is useful for surveyors, contractors or homeowners. *As Chartered Surveyor Martin Conners rightly points out below, failure to ventilate redundant flues is also an important factor. This doesn’t apply in this case study, but if the damp patches are on unventilated redundant flues and not immediately adjacent to the external stack/flashings, condensation in the flue may be the cause. If that’s the case then ventilate the flue – though by then the damage is done; ventilation will not remove the salts from the plaster, brickwork or stone. I have an early 19th century stone cottage, the internal wall of the gable end downstairs has lots of dark greasy patches of damp, it never gets mouldy but it doesn’t seam to go away either. we have recently fixed a Leakey chimney stack and sorted out what was a way in for the water however the damp seams to keep showing some days it looks much worse, I understand it could be salt but the damp is not just on the chimney walls. I did try the kettle test but I didn’t notice the steam being attracted to it. The exterior wall is a heavily cement rendered wall, with a stone construction probably just an infill rubble wall. the interior is plastered gypsum. My thinking is to remove some of the render to see if the internal wall dries as I don’t think any water that could be inside the wall has anywhere to go? I dont really know how to diagnose the damp problem, as the chimney is now tight the render is good there may be some small areas water could get in but not to the extent it is showing as damp. Thanks for any advice! Thank you for getting in touch. I can’t survey on the internet I’m afraid. 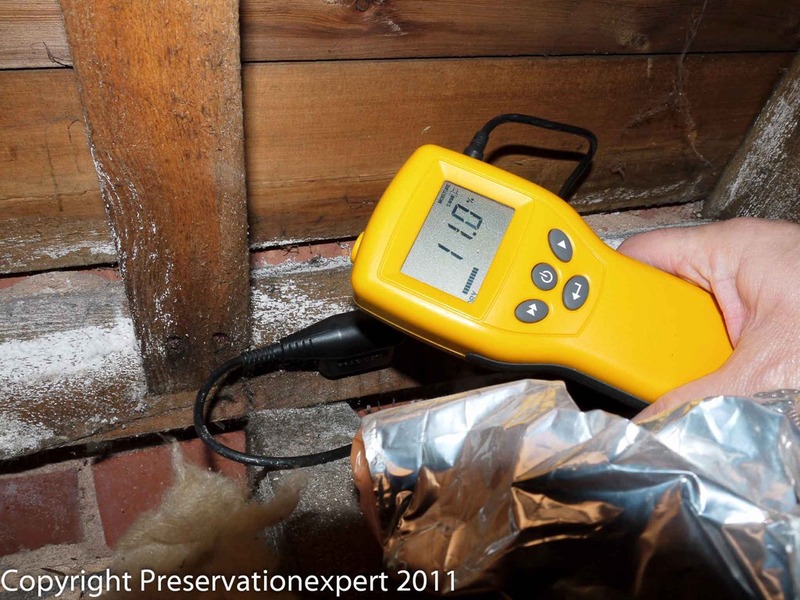 Just gently hammer test the render – if it is solid then do not hack it off. if it s cracked and hollow then it will be causing some problems. Thanks for this – and all the responses. Ive been trying to find an answer to my damp chimney. Old victorian house. Internal chimney stack on the roof was removed and tiled over – also had a velux window fitted in line with where it used to be. On the ground floor – I have 2 damp patches either side of the chimney breast. Above the skirting board rising to about 24 inches. Thought it maybe rising damp – so took the skirts off – and it was dry – so not rising damp I think. The external wall has been re rendered with lime. Ive had new gutters and facias fitted. The non working chimney flue has an air brick at the top to vent air out on the second floor and the fireplace is open. The chimney breast seems to have a mixture of lime and gypsum – which has been painted over. 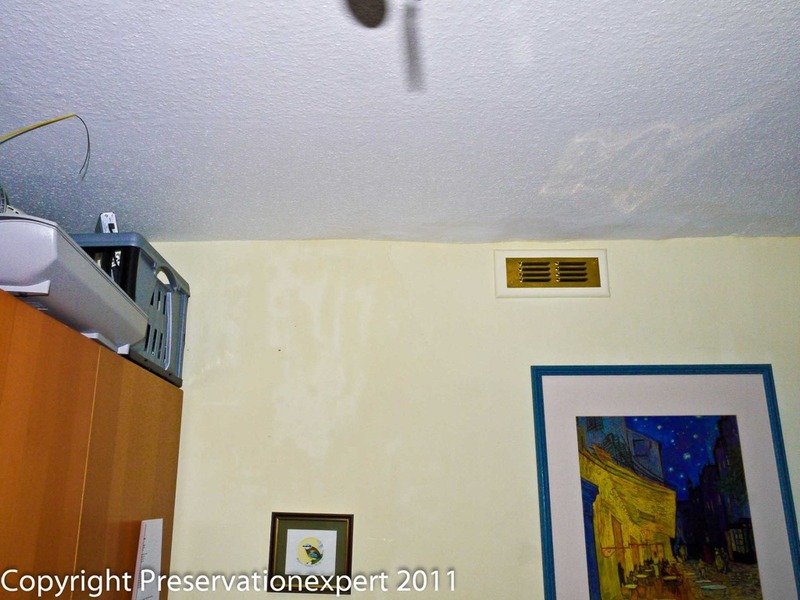 Recently after all the hot weather we have had in May/June – I noticed the wall was really wet over a weekend, we also had 3 adults in that room using it as a bedroom. SO – am I right in thinking that I have an air flow problem ? , hot moist air in the room is rising up the chimney and then cooling down as there is not much draw – it’s then condensing and coming back down the stack – is that possible ? It is definitely a salts issue as the paint every 2 weeks or so I have to brush off the dust / salts that have gathered on the damp patches. Can you suggest anything ? My next plan was to take out a brick or 2 on the external wall (there is a lean to that is a storage room) so I would have access to behind the chimney stack in the hope of creating a stronger air flow – AND at the same I was going to close up the fireplace opening in the bedroom – so the room stays warm – but yet the unused chimney is still well ventillate. Does that sound like a logical idea ? – this problem has been driving me nuts for the last 2 years…. Ventilating a chimney should not normally cause condensation within it. It should help keep it dry. If you have a high internal humidity though, it can cause issues. Are your ‘wet rooms’ such as the kitchen and bathroom equipped with good mechanical extraction – this is a must. There may be a slat contamination problem but if you are getting salts appearing=, which have to be brushed off, this implies water is rising or moving through the wall. This is what these efflorescent salts indicate, as they are merely minerals from the water being deposited on the surface as evaporation happens. Hygroscopic salts do not do this, as they remain in the wall or the surface – a damp greasy patch, rather than an obviously ‘salty’ patch. You need to control the ventilation at the source of the water vapour. Then you need to find out where the water causing the salts is coming from. It sounds like it may be rising damp…..
sorry – I should have added the velux shows no sign of any leaking – I have had a hose pipe on it – no visible water on the timbers. I am also going to take the floor boards up in the loft and try and expose the top of the old stack , to maybe increase the air flow further. If you can think of anything else to try – please let me know here – or email etc. I;ll respond how I get on after a few months. We have recently completely removed a chimney the builder roof tiled over where the chimney was, this exposed the flue I and they applied dot and dab plasterboard, when the tiler came to tile the room there was a patch that would not dry out enough for him to tile, we then replaced the render on the outside of the wall on the builders recommendation, then the lead roof valley, still would not dry out. The damp patch was mid wall so the builder hacked off plaster and replaced with bonding. This never dried out and get wetter when rained. Do you think it’s salt contamination? I think you know now that this is almost certainly hygroscopic salt contamination. Bonding is the last thing the plasterer should use. Either use a dense render or put a membrane on first to protect the new plaster. Always take the plaster at least 300mm past the last extent of any stain. I’ve seemingly a few issues, the main one seems to fit in to the salts, I’ve a 1850’s house where the chimney has been blocked up in the main sitting area but also the kitchen. as you would expect the chimney has been pointed cowling done and all that jazz, yet we are getting damn patches which seem to have spread due to a leak which has since been repaired. the water marks are on the main breast in patches, but also on the wall that divides the kitchen and living room, where at one point I can only imagine had a fuel burning stove in the kitchen. This weekend Ive opened up the main fire in the living room (yet to check and open up the one in the bedroom above, although the issue is only down stairs) when I did, it has rotten wood screwed into the wall where they have then attached the plaster board on either side of the fireplace, it is so damp it stinks to high heaven… anyway the problem persists.. seemingly traveling along said wall to the other side of a doorway and down that wall also…. to make the problem harder to diagnose the wall on the other side of the door way Ive just mentioned seems to have damp penetrating from the seal in the front door which has a tide line on one side of the wall and blown out plaster on the other, I’m not convinced this is rising damp as the meter reading shows low at the base of the wall and increases mid way circa .5 mars then reads less again at only .7 mtrs. and if that isn’t bad enough the property at some point was plaster boarded on some walls which also now show signs of damp, specifically the right hand corner nearest the fireplace where it almost seems visibly wet. and further more into the corners of the wall. I’m not sure all these issues are connected is this possible or do you think I’ve several issues? what cause of action do you recommend I take (the house has blue brick as the damn course and was also injected above that about 16 years ago) please help its driving me nuts trying to find and fix…….I’m seriously on a budget and I need to fix this as we are hoping for news of a baby soon….. When damp rises it will often leave a salt band, which means subsequent meter reading can peak at the highest point of rise. I cannot survey via internet and as you mention several issue i think I could mislead you if i tried. You need to find a good damp specialist with a reputation for skill and integrity. Ask around some chartered surveyors in your area. They usually know who will tell you the truth. Make sure they have CSRT qualification though. Ideally the ones who charge a small fee are less likely to be chasing work. Or if funds allow, get an independent specialist surveyor from the PCA web site. Cost a bit more but they will not be at all interested in getting a job out of the survey. That said, there are good contractors who see ‘no evidence’ or ‘advisory’ surveys as a good investment in the goodwill their company builds over time – they are the best in my view (I’m biased of course). Just wanted to say thank you for responding and your advice. Peter again from the above thread comments – I have now injected on the external wall (which is actually a lean to type room). I have removed the skirts all around the chimney stack – the mortar all seems dry – but the wall the skirts is wet. Seeing as I have the DPC cream – I will inject anyway – but where ? do I go high , ie the top of he skirting or do I go low at floor level ? i like having windows open but unfortunately only live there at weekends – work getting in the way! after all that the damp patch is the biggest its ever been and doesn’t seem to be going away! any ideas would be great!! Thank you for getting in touch. It seems that you have done everything you should externaly, so that leaves hygroscopic salt contamination from the chimney flue as the probable culprit. Follow the previous advice to either dry-line or hard plaster the area. |A membrane like Safeguard XP or Drybase Flex could also be used. Don’t plaster it with lime or gypsum as the salts will just migrate into the new plaster. Most of the plasterboards with insulation on the back are ‘closed cell’ foam. Check this with the supplier and it should be fine for this job. Don’t apply by ‘dot and dab’ though. I read with interest the many problems people have in older houses with chimneys and walls below. Our house was built in 1905 and in the past few years four different builders/roofers have been up and done repairs to the chimney, flashings, caps etc. and a lot of money was spent. Last repairs this May. I was told by the last builder that no more problems should occur. Now the chimney breast is damp again and as are bits of the ceiling above. I am at my wits end and since the chimney is not used a neighbour suggested that I should have the stack removed. Would my problems after that not reoccur? And if the removal of the chimney stack is advisable then how much would I expect to pay. It is a semi detached house with the chimney stack on the detached side of the roof. Many thanks for any advice. It is a drastic thing to take the stack down and replace the hole in the roof which it will leave. Sounds like a salt damp issue. Print out and show the post to ypur builder and see what he thinks about tackling it from inside. Wish I’d found this site earlier. Thanks for the information – I’ve had 2 surveyors, 4 roofers, 2 buliders and a chimney sweep involved all offering different advice. My damp patches, in the bathroom, get worse when it rains or when there’s moisture in the room. I assume this means the salt is attracting moisture from the loft space and/or inside the chimney as well as the room. Am I ok using your membrane and plaster advice for the visual problems (wall and ceiling) and leaving the inside of the chimney as is -assuming the inside of the chimney would show patches if we could check? If not how do I address any chimney issue – flue liner? Do I need the wall dry before the membrane is added? If the plasterer is booked for a wet day that could be difficult! Membrane systems are designd to be applied to a damp wall so there is no need to wait for it to dry. However, make sure that any leaks are repaired first. There are always salts in chimney flues; as as long as the dampness cannot appear on the decorated surfaces (because you’ve either applied a membrane or lathed dry lining), it isn’t a problem. Help, we share a chimney with a neighbour. It serves our ground floor and their bedroom. Their chimney breast was blocked up and ours open but neither in use. The flaunching sealed the chimney but was in poor condition as was the pointing, there was no ventilation or pots. They have had the chimney repointed, a new ventilated pot on their side and put an air brick in their originally blocked up chimney breast. On our half they just renewed the flaunchings so still there is no ventilation. 24 hours later we have the worst lingering damp smell in our room. Even before the work took place our chimney was not ventilated but never ever smelt damp. Now the smell fills the whole house. What happened? Thank you for looking in. Something has changed of course. I can’t really get sufficient detail from ypour message to give you advice. You need an experienced and qualified specialist to look at it. You can find good surveyors via PCA and via RICS. I am hoping you can help me, I have a damp patch on my chimney breast just above the mantel piece that’s getting bigger but in dry weather it seems to dry out but then come back when if it rains or is damp outside. its an old 1910 house and I had roofers round twice and they did all the pointing etc on the stack. I have been told its Hygroscopic salts, I am planning on getting a log burner next month and I didn’t know if this may dry out the problem? I have been told if its salts its pretty much impossible to fix unless you get a membrane and re plaster. I have already spent a lot of money on the stack so don’t want to spend loads more. I also got told to peel the rest of the wet paint off on the damp area and coat it with aluminium wood primer? could this possibly help fix the problem? the damp patch is around 50cm high and 30cm wide. It does indeed soul dlike the plaster has salt contamination. Why not just replaster with a good quality renovating plaster? This would mean hackingoff the plaster at least 500mm past the extent of the stains. (better still use an electricic moisture meter to find the extent of the spread). I would use Safeguard DryZone damp resistant plaster. Apply a latex (SBR), bonding agent first to kill the suction and help avoid any salts migrating whilst the plaster dries) The fact that you have a stack in good condition and which will be used with your new fire, means that a membrane may not be needed. Really helpful information here and confirms my suspicions that we have hygroscopic salts in the walls / ceilings of 2 bedrooms of our Edwardian house. Both are linked, I think, to previous roof leaks around chimneys. One was fixed at least a year ago and we thought the walls / ceiling were as dry as they were going to get so had a plasterer remove some blown plaster on the wall back to brick work, patch it and then skim the whole wall before painting about a week or so later. (Not sure if there was wallpaper removed too before skimming.) Whilst painting, a chunk of skim (straddling new and old plaster) fell off. He claims this must be due to new damp coming through so he removed an area of plaster back to the wall which he said was damp. I find that hard to believe but have left a dehumidifier in the room to dry it as best we can. Now another area of the skim is cracking badly and sounds hollow. I think this is over old plaster rather than a new patch. I am concerned he hasn’t prepared the wall properly but he is claiming it must be due to new damp. I don’t know what to do as pretty sure there is no current source of damp. Would old damp cause new skim to fall off? Decorator has used Zinsser on ceiling stain and that seems to have worked there. However, concerned stain will just migrate beyond this or will it just stay behind it? Sorry – 2 queries really! Dampness cause by hygroscopic salts would not make new finish fall off or de-bond, at least not for many months anyway. It’s likly the wall wasn’t prepaired correctly, especialy if the finish is ‘hollow’. The ‘patching’ should be done with a good renovating plaster or sand/cement – never gypsum. Thanks for looking in and good luck with it. Thank you so much for taking the time to put these posts on, needless to say it covers pretty much everything I have in my victorian house. This has been very helpful but a few questions i have a 1930’s detached house and both internal chimneys have salt contamination which i believe is because the chimney was blocked around 4 years ago. After the stained spots started appeareing i opened the chimney back up and the humidity in the room has dropped so i have knocked all the affected plaster off. It has now been off for 6months and the meter still reeds damp if i leave the brick exposed will it ever dry out so i can just replaster with normal gypsum plaster or will i have to use a membrane? Would getting a bricky to change the affected bricks sort the problem or would it come back? also i want to mount a tv on the chimney when its sorted will i be ok putting a wall mount up as i would have to drill through the membrane (if i use one). plaster/dot and dab on a vertical membrane. The above assumes you have ruled out direct water ingress. Very glad to have found this and you are extremely generous to share your knowledge. I think that I have a salt problem in my chimney. The house was built in 1890. It has been plastered over and still giving problems. I think that there was a lime plaster on below layers. Should I hack off the new plaster and lime plaster below and tank it with something like febtank (or what is the cement based water resistant system that you recommend?) and then plasterboard over that, or could I paint a waterproof sealing paint directly over the stain? If you want a traditional repair then Safeguard Europe do a lime based renovating plaster. An alkternative is to plasterbaord but you’ll need to mount the boards on treated laths not dot and dab. Last year i had a chimney stack taken down several layers as it was unsafe and above my child’s bedroom. I believe the stack was blocked off with a paving slab and mortar. Since this change we started noticing damp patches either side of the chimney breast on the internal walls in the upper landing. Lead flashing, mortar and several other things were done to check the remaining stack but the problem still occurred. On the builders advice we had new roof fitted along with guttering and fascia boards. The chimney stack was removed below roof level to inside the loft space, however the problem still occurred. I removed the paint skin and plaster behind the damp and all material are bone dry even when it rains heavy, therefore i’m sure its not a leak or penetration rain through the wall. Does my roof require ventilation for the chimney stack inside? 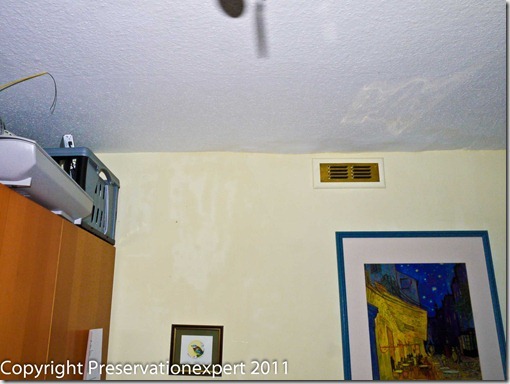 Is issue condensation due to poor ventilation? Will the new plaster that needs applying need to be special type? You know that no water is coming in. That leaves only condensate or salt contamination. Condensate is common but why is it happening there? Is it happening anywher else? Have you good extraction in the kitchen and bathroom? If you do have good extraction and the problem is only happening in that place then salts are more likely – replaster with either a good renovating plaster like Safeguard DryZone or dry line the area on laths. Can you help please I live in a bungalow and in our living room we have a damp patch on our wall above our fire on the chimney breastfeeding with a damp patch adjacent to it on the ceiling. Would this be due to cold spots as we have cavity insulation bit I’ve noticed a void up there in the loft. Was told it was rain coming in but it’s funny it only appears when the cold weather comes . Am I right to say try putting vermiculite down the back of the breast. It may well be a replastering job, follwoing one of the methods I mention. I doubt it has anything to do with the CWI. I’d have to see it I’m afraid. However, granit is usually very dense so I doubt water penetration is happening (taking into accout the work you’ve done). The fact you get water there when it is a hard front suf=ggests condensation on the cold stones or maybe some salt contamination (RH% is always high in very cold condition, even though the amount of water vapour in the air is low). You may need to call in a good surveyor. Wow so grateful I found this site. After 3 years of watching a chimney breast stain grow and having everything possibly known to man to fix it I feel that the problem is salt. We recently had some work carried out I’ve used a de humidifier, burnt wood through the chimney and kept my little boys window partly open. The damp has dried slightly but once I stopped using the fire it appeared darker. The room is plastered and I’m thinking 3 years of water leaking in has left the salt in the plaster. The leaking wasbonly fixed in November. Could I be right? Thanks Bryan for this highly informative site. I have three damp stains on the wall to the chimney in my kitchen, which is flush with the rest of the wall. There is also a chimney in the living room, and they share the same stack. But whereas the living room chimney is used – we burn coal in the fireplace – the kitchen one was blocked up about 15 years ago. One stain is about 40cm across, one 20 cm across, and I also have a curious but dark stain about 2cm across. The top large one has also spread to the polystyrene coving. There actually are a few chipped tiles on the roof not so far from the chimney, but the thing is that there is no obvious ingress of water on the underside of the roof, or on the wall of the chimney in the loft, or indeed anywhere at all. There are signs of water having come into the plaster on the chimney wall in the loft in the past, but it’s bone dry now. One can also see dark lines there which I take it are soot. I live on the Isle of Lewis, where I am an incomer, and this is a small place, and builders have said they could do things like redo the roughcasting on the chimney and remove the cope and recast a replacement one in situ. (“Putting on a new cope will cost £1000 – do you want us to do it?”) But there does not seem to be anything wrong with the existing cope, except for a very very tiny crack in one place, and I doubt that that could be the cause of stains of such size. I should add that there is Artex on top of the chimney wall in the kitchen, so the stains that I can see are in the Artex. Having read what you’ve written here, I am tending towards the view that what I should do is a) deal with the stains in the kitchen, b) seal the outside chimney wall and cope, c) get someone to change a few tiles – b) and c) being basically prudent maintenance, with a) being the main work that addresses the problem in the kitchen. Hygroscopic salt sounds like it. What do you reckon? And what work would you recommend that I do in the kitchen? Ideally I would like to put Artex on top of whatever I use, although if that’s not advisable I can find some other solution, perhaps a mock breast made of brick slips or whatever. What I mean to say is what layers of what materials should or might I apply once I’ve chipped away the Artex and plaster and whatever I find that is holding the stain? Once again, thanks for this much appreciated site. Correction – the coving is gypsum! Just wondered what you think best course of action is? It’s nto getting worse but looks unsightly. Log burner working well but interstetingly the patches only really apppeared when we stopped using it fully as weather got warmer. You can’t use a plastic membrane near a log burner. You can apply a heat resistant render inside the fireplace like NATCEM or similar. If the wall has become damp when the fire is not used it could well be hygroscopic salts. Spending big money just to make the inside of the fireplace look better sounds a poor use of your money – a render would be cheap and effective. Don’t skim it – gypsum breaks down under high temps. Thanks for reply sorry only just re -read the post I sent. We still have not had anyone to sort out issue yet (waiting on a builder to come and sort) so you say to take off old plaster and render with the heat resistant render? Will that stop the issue happening again? Should we add /put anything on the brick to hold back the damp or not?